The sweet twittering of tiny song birds chirping back and forth are one of the first sounds to announce that the season of awakening has finally arrived! Charming images of lovely song birds and an adorable garden fairy are the perfect accents for all of your spring themed creations. 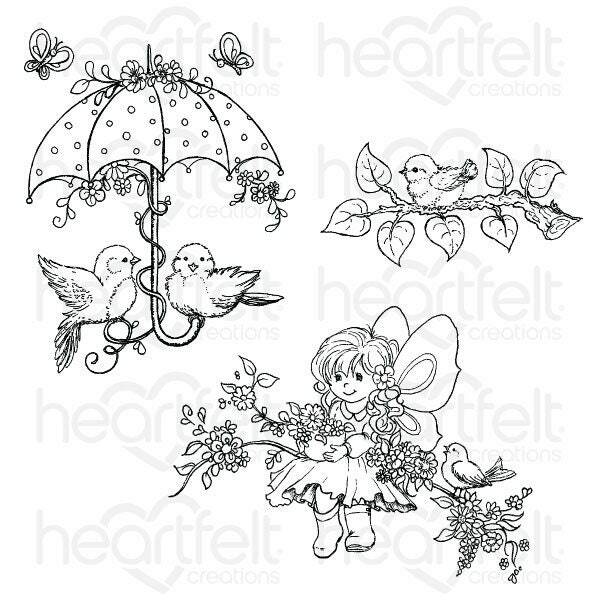 The beautifully adorned umbrella illustration is delightful for those spring season baby or bridal showers, while the cute and captivating garden sprite makes a wonderful addition to cards and scrapbook layouts for the garden enthusiast! This cling stamp set is part of the Singing in the Rain Collection and pairs with the Songs of Spring Die.